Popularized in the 1990s for sports enthusiast, the hydration pack has come a long way since its inception. A market that was once dominated by a select few brands is now flooded with variations of all shapes and sizes. There’s a lot of great choices and some mediocre ones. Let’s take a closer look at some pros and cons of today’s best hydration packs and what you should be looking for when sorting through your buying options. Determine which activities you’ll be doing with your hydration pack. For example, if you’re going to be running with it, you’ll want something light-weight and balanced that doesn’t impede movement. If you’re camping and hiking, your primary concern might be the capacity of the bladder to hold more water for longer trips in dry environments. Consider your budget. If the sky’s the limit, there are top-of-the-line packs that have all the bells and whistles. If you’re on a shoe-string, you might consider doing away with some of the flash and popular brand names in exchange for a bare-bones yet reliable utility tool. Will you want to go with a bladder type pack or one that utilizes bottles? Bladder packs tend to hold more water than bottle packs, however bottle packs are easier to gain access to and can be refilled quickly and easily. 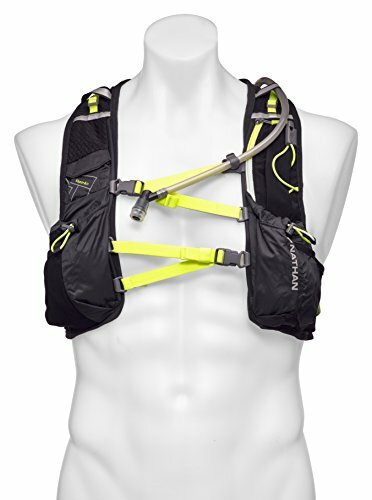 Which hydration pack is best for my needs? Which features are the most important to look for? What is the most trusted brand of hydration pack? I’m a casual hiker, is a hydration pack overkill? 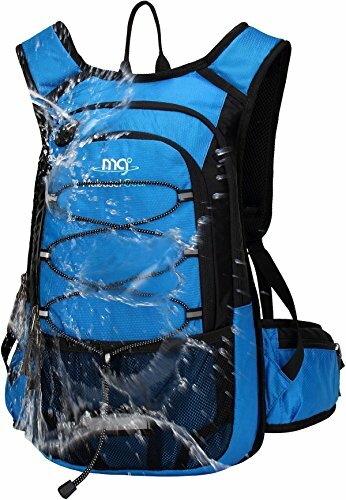 One of the undisputed champions on the hydration pack market is the Mubasel Gear Insulated Hydration Backpack. It’s no wonder this pack currently ranks in Amazon’s top ten picks. With some cool features and a sleek look, the Mubasel also won’t break the bank. Costing you around thirty bucks and coming in an assortment of colors, you’ll get a 2-liter BPA free bladder that’s housed in an insulated compartment to keep water cool for up to 5 hours. Padded, breathable shoulder straps and a relatively light-weight design make the Mubasel Hydration Backpack a great choice for longer hikes and even running. For activities that require more movement, the adjustable comfort waist and chest straps help keep things snug. For additional storage, you’ll get another zipper compartment as well as a mesh front pocket to hold your belongings. Relatively inexpensive at around 30 bucks. weighed down during training or hikes. Larger people might find this pack on the smaller side. Backpack material is not the most robust. Overall a great choice for pretty much any activity, this pack offers all the basic features you’ll want with a price tag that’s pretty darn reasonable. 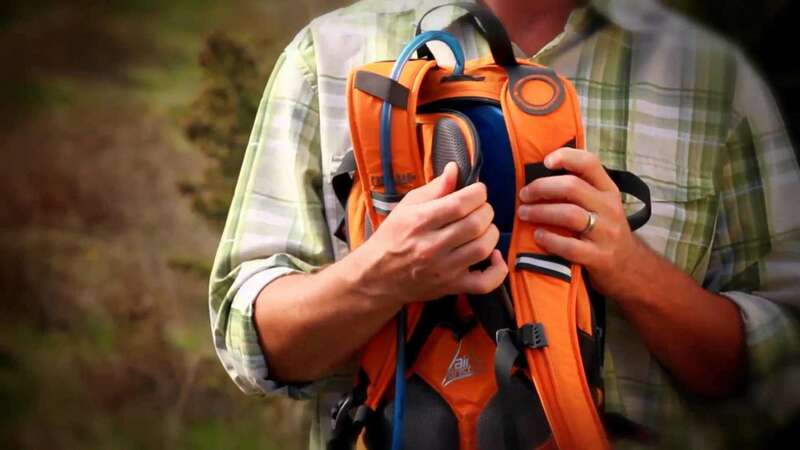 Veterans and first-time buyers will find this a great general hydration pack that holds its own well in a competitive market. The added perk of the included tube brush cleaner makes the Mubasel Insulated Hydration Backpack a slam dunk. 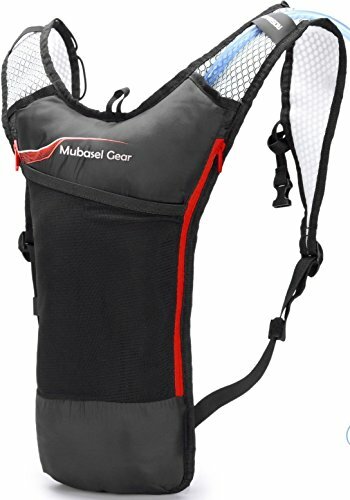 For those on a tighter budget, an excellent choice that’s simple and effective is the Mubasel Gear Hydration Backpack. Sporting a 2-liter bladder style hydration bag, this backpack gets backs to basics while still offering a few added features. Including two small zipper compartments on either side, you’ll have just enough room to store keys and a few valuables while you’re on-the-go. Constructed from a highly light-weight nylon material, you might find the low-profile of this pack especially useful while cycling or running. Though the smaller size limits the amount of storage you have, it more than compensates with its movability. A breathable mesh foam back with light-weight mesh straps help keep the pressure off your shoulders. Granted, the material is slightly flimsier than some of its competitors, but some might find this a welcome feature on hot days and longer hikes. Just keep in mind that this pack is probably not going to do well on a heavy-duty, reconnaissance type mission. Low profile while still maintaining the standard 2-liter water bladder. Not the most robust choice for strenuous activities. A great value for your money, the Mubasel Gear Hydration Backpack will supply you with a solid, all-around pack while not breaking the bank. Some may choose this pack for the simplicity of its style alone. Despite its low-profile and smaller pack size, it still manages nicely to deliver the standard 2-liter capacity. When it comes to running, hydration packs are built specifically for the lowest profile possible while still maintaining enough room for water storage to keep you hydrated. Though not as affordable as some of the other candidates, the Nathan VaporAir Running Vest is one of the best choices for this strenuous activity. Their over-the-shoulder load carrying straps keep this pack as close to the body as possible, minimizing the bounce of the pack when you’re running. Because the Nathan VaporAir is a vest style instead of the traditional backpack, breathability is at its best. This is a major factor for marathon runners. Holding 2-liters of water in a remarkably small space, the refillable bladder can be complimented with flask size bottles in the front storage compartments (bottles sold separately). For those that prefer to use the side and front storage pockets for other utilities, they’re just big enough for the essentials like car keys, salt tabs or a cell phone. Reflectors sewn into the vest material also make the VaporAir ideal for safe night running. Extremely low-profile minimizes movement restriction and limits bounce when running. Pockets large enough to carry additional water flasks. Reflective, bright material makes it a top choice for night running. Sizes tend to run small and may not suit larger people comfortably. Ideal for runners wanting to keep things light, the VaporAir Running Vest delivers the standard 2-liter storage capacity in one of the lowest profiles on the market. Used by professionals and novices alike, the VaporAir has been smartly crafted to accompany athletes on rigorous marathons and not get in the way. Comfortable and relatively affordable, we recommend this pack to those whose primary use will be long distance running. For those wanting to eliminate the bulky feel of hydration backpacks altogether, the waist pack is a great alternative to keep things light. Although they don’t carry nearly as much water as their backpack cousins, for shorter runs and hikes these will get the job done nicely. 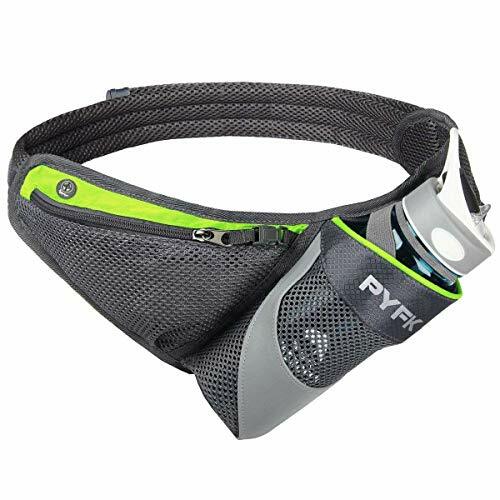 The PYFK Running Belt is one of the best waist packs we’ve seen and helps to eliminate the common complaint that they just don’t carry enough liquids. With a capacity to hold up to 27 ounces, the smartly designed angled storage ensures that your movement will never be impeded. Many people wear this pack with the bottle situated in the back and find they don’t even notice it’s there. With a two-compartment design, one for the removable bottle and one zipper pocket for storage, the Running Belt is a no-nonsense trail companion. A convenient earphone port, located above the storage pocket, is a small but appreciated feature many runners will benefit from. Available in a few color choices and sewn with a reflective material, the PYFK Running Belt can also be used safely at night. Probably the lightest-weight and least impeding hydration pack on the market. Good storage room for up to 27 ounces. Holds less water than a hydration backpack. As one of the best alternatives to traditional hydration backpacks, the PYFK Running Belt is a great choice for those who don’t want any extra weight on their backs. Beating the competition for storage capacity at 27 ounces, this belt helps to deliver a realistic solution to hydrating on short to moderate runs. Tailored for day and night use, we recommend the PYFK as one of the great contenders for staying hydrated and keeping things safe and simple. While certainly not the cheapest hydration pack on the market, we felt it was worth mentioning a classic brand that has been the forerunner of hydration gear for decades. The CamelBak M.U.L.E serves its purpose admirably while providing an impressive 3-liters of water capacity, magnetic tube trap for easy no-look access, an air-director back panel that helps keep things cool and even a helmet strap. Being around for as long as they have, CamlBak has the luxury of experimenting with added features such as an anti-microbial HydroGuard coating that prevents bacteria build-up in the drinking tube. For those that find storage to be an important factor, 5 compartments allow you to carry a host of gear with you. Overall a great choice, if you have a little extra cash to invest in your hydration pack, the M.U.L.E offers a lot of great features from a tried and trusted brand. Smartly designed and well crafted so it’ll stand the test of time. Not the cheapest option with a price tag of around $100. Heavier and bulkier than other packs in its class. If money is no option and you want to go with a brand everyone trusts, the CamelBak M.U.L.E. will deliver. As one of the originators of hydration packs, famous for including useful features, CamelBak might surprise you with subtle conveniences others don’t think to include. Built-strong, with a larger water capacity than most of the competition, the M.U.L.E. is the perfect companion for hitting the trails on longer hikes where a little extra weight is not a concern. It really comes down to the type of activity you’re most likely to be doing. While there are some great universal packs on the market, you’ll always fair better if you go with the pack that is most geared for the job. Runners competing in a marathon will suffer under the weight of a bulkier pack and therefore want to go with something light-weight, like the vest example mentioned above. Hikers, who are moving more slowly and are exposed to conditions with little water for longer periods, will benefit more from a heavier, higher capacity pack. Consider your budget and pay for the important features first. While there’s a lot of impressive bells and whistles that brands offer their buyers, water capacity and overall comfort should be the highest on your list of priorities. A patented locking mechanism on the water tube is nice but less important than how long your water will last on a hot day. There’s a whole gamut of brands to choose from these days, all offering some added feature or extra storage capacity. The two brands that seem to stand tall when the smoke clears are the tried and tested CamelBak and the younger, but equally impressive, Mubasel Gear. 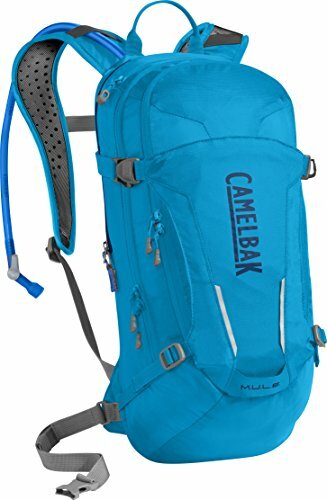 While CamelBak has been around the block and proven itself to be a solid company, you might be spending a few extra bucks for this reputation. Mubasel Gear is able to offer features equally impressive to that of CamelBak with a price tag you’ll feel much more comfortable with. While we’re not advocating spending money needlessly, we have to say, that even casual hikers and joggers tend to benefit from the conveniences of a hydration pack. The first time you venture onto the trail not burdened by a bulky water bottle, you’ll see why this simple and effective piece of gear has become a staple for professionals and novices. Even a short family hike is more enjoyable when you know everyone has enough water to keep things comfortable. On hot days, you might be surprised how fast you can get dehydrated.